The Voices is a film that features romance, comedy, horror and drama. It is outstandingly funny, sad, bloody and a film that can't be classed in to one specific genre. This isn't your typical guy can talk to animals movie. Jerry (Ryan Reynolds) is an uninteresting friendly guy who works on the factory floor at a bathtub factory in a small town. All he wants is his colleagues to like him, have a romance with one of his colleagues Fiona (Gemma Arterton) and lead a completely normal life. The only problem is when he gets home he has full blown conversations with his pet cat, Mr. Whiskers, and loyal dog Bosco. One night he accidentally kills Fiona and with the help of his evil cat Mr. Whiskers he covers his tracks. Despite Bosco and his psychiatrist Dr. Warren (Jacki Weaver) trying to keep Jerry on the straight and narrow, Mr Whiskers seems to be the only person Jerry seems to be listening to and soon events have spiraled out of control. Mr. Whiskers plays out Jerry's predatory part of his nature and his dog Bosco is the other side, the good part of his conscience. The three way conversations that they all have are just genius, funny and highly entertaining. Once the room starts getting filled up with other voices in only starts to make things even more interesting. Jerry's whole life seems colourful, forcefully happy and it doesn't take long to realise that the world you see in this movie is the pretend world Jerry makes for himself, you get a glimpse of what real life is actually like when he starts taking his medication. 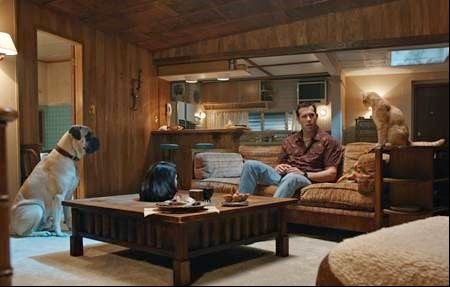 Ryan Reynolds performance in The Voices is a perfect fit for him, the comedy aspects in this movie really suit Reynolds and with his looks and a little creepy vibe it makes for a perfect Jerry. It could be his best performance so far. The moments of general horror in this movie are great (there aren't a lot of moments of just horror most are added with comedy) and the director Marjane Satrapi, does a fantastic job of making Jerry's flashbacks of his childhood disturbing. This movie is great from beginning to end, definitely worth a trip to the cinema. And remember to just 'Sing A Happy Song' (You'll get it if you watch the end credits).